Pet Shop Boys Neil Tennant and Chris Lowe have, in a pop music career spanning over a quarter of a century, earned the right to indulge themselves now and again. But their debut score for a full-length ballet, in three acts, choreographed and directed by sometime enfant terrible Javier De Frutos and based on Hans Christian Andersen’s story The Most Incredible Thing, offered rather more than mere whimsy. Indeed, had a kitchen sink been wheeled on, it would have caused little surprise or consternation. More surprising was just how many other – often wildly inventive – production elements vied for attention with the dancing supposedly at its core. The story, written in 1870, is a rather feudal tale. A king decides to offer half his kingdom and his daughter’s hand in marriage to whomsoever can show him ‘the most incredible thing’. A young artist named Leo, danced by Aaron Sillis, dreams of a life beyond the daily grind and determines to enter something into the competition. Assorted sub-X Factor acts show up with their own designs on the princess and her inheritance, only to be batted away by a Davina McCall homage competition compere who speaks, rather than dances. Leo advances his idea – a clock containing dancing figures. Everyone agrees it is the most incredible thing – until the villain of the piece Karl, danced with wonderful poise by the project’s instigator and sometime Royal Ballet star Ivan Putrov, smashes the clock; his destructive act is – under some coercion and after not a little violence – agreed to be the most incredible thing instead, and Leo is imprisoned. It is during the fantastical second act that we delve into the magical world of the clock, whose figures come to life and regroup to wreak revenge on Karl. What follows is surely the longest live action pop video yet produced, replete with intricate scenery flying in and out again with dizzying speed while the dancers get visceral here and there, almost as if to remind the audience that it’s supposed to be a ballet still. In truth it’s more than that – hugely ambitious, but so chock full of visual and musical ideas that there’s little time or space in which to absorb it all. Watching the extraordinary visuals alone is a mesmerising – and at times baffling – experience, but as part of the whole they intrude and dominate centre stage. By contrast the music rarely does – there are few of the out-and-out pop hook moments Pet Shop Boys are well capable of in a score big on bombast. Yet it’s unmistakably the work of its authors. The final act feels dramatically a little rushed, tying up the loose ends in a rather preordained manner and rapidly reaching the inevitable happy-ever-after. Visual references to Tennant and Lowe’s past projects abound. Soviet-style lettering, graphics and angular set and props call to mind the Battleship Potemkin score’s cover art, while the militaristic ensemble movements during an early scene depicting the daily grind, from which Leo seeks escape, directly channels the Go West video – even down to the boiler suit costumes. Indeed, with wild flights of fancy from the visuals team dominating the show from beginning to end, the overall effect is less ballet and more pop video. Tennant and Lowe’s mechanistic score, making good use of the live orchestra but wilfully pulverising it with ’80s styled electronic beats of the sort found in every Pet Shop Boys hit, marries well with De Frutos’s bold, visceral choreographic style; neither allows much space for subtlety or intimacy, preferring instead to make bold statements while keeping the senses stimulated and surprised throughout. 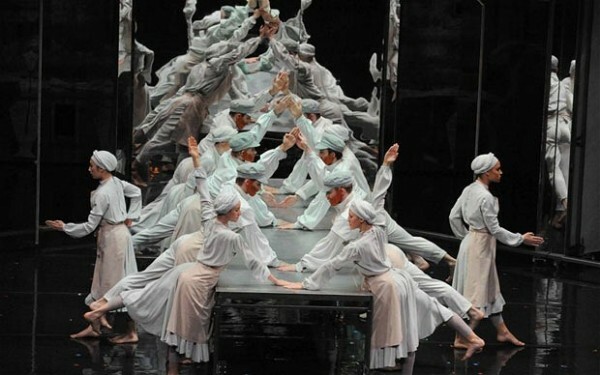 Yet to witness a ballet at which the dancing is the least memorable element is surely a peculiar state of affairs – and the fault of De Frutos, as choreographer and director. Ballet purists will likely loathe The Most Incredible Thing which, with its inventive use of straight acting, visuals, animations and even pre-recorded films, is more of a mixed media work in any case. But the story begins with Leo daring to dream; Tennant, Lowe and their associates have taken it upon themselves to follow his example and see where their particular dreams can take them. They’ve created a lavish, if imperfect, piece that deserves to be judged on its own terms.